Jimmy Webb is a pop music treasure. Viewed in terms of numbers and statistics, he’s among the most successful songwriters of all time. His songs have been recorded by more than 850 artists (more than 80 recorded covers of his 1967 composition “MacArthur Park”). His songs have hit the American Top 100 more than 30 times; his tunes have shown up many times on the Country, Adult Contemporary and R&B charts; “MacArthur Park” even hit #1 on the Dance charts in 1978 in the form of a cover by disco diva Donna Summer. He’s written more than 650 pieces of music – songs, themes, film scores, incidental music – and recorded twelve albums of his own. But because he has often worked behind the scenes, he is perhaps not as well known as many lesser-successful songwriters. And though he’s a lifelong fan of rock ‘n’ roll – and was part of the out-of-control coterie of music celebrities that terrorized the mid 1970s L.A. scene, a loose aggregation that included John Lennon, Harry Nilsson and Keith Moon – he’s most often thought of as a MOR (“middle of the road”) artist. Perhaps balancing out some of the prestige Webb has earned over the course of his half century in music, “MacArthur Park” regularly shows up on worst-song-ever lists. Critics enjoy poking fun at its lyrics (example: “Someone left the cake out in the rain / I don’t think that I can take it / ‘Cause it took so long to bake it / And I’ll never have that recipe again”). Jimmy Webb takes it all in stride. Today at age 70, he can afford – both creatively and commercially – to rest upon his achievements, but his restless, ambitious nature means that he stays busy. Though his most recent album, Still Within the Sound of My Voice, came out nearly four years ago, Webb tours regularly. These days those tours often take the form of a one-man show packed with as much storytelling – for Webb is a consummate and natural tale-spinner – as music. 2017 shows fall under the banner of the career-spanning “Evening With Jimmy Webb” and a more focused set, “The Glen Campbell Years.” The latter covers the Jimmy Webb songs popularized by the popular country/crossover artist, including “By the Time I Get to Phoenix,” “Galveston” and others. And if all that weren’t enough, in April, Webb published his first book, a highly readable memoir titled The Cake and the Rain. That phrase is a nod to the most memorable lyrics from “MacArthur Park,” and the book’s narrative shifts between 1969 and Webb’s life up to that point. 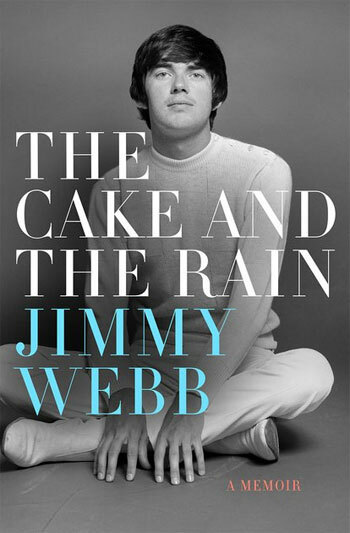 The Cake and the Rain is idiosyncratic in many ways, but it’s a well-written and unflinching look at the ups and downs – mostly ups, it should be noted – of the first 25 years of Webb’s life. One of the most enduring characteristics of Webb’s songwriting is the universal nature of his songs; they can be effectively interpreted in a wide array of styles. While he admits that in the earlier phase of his career, he’d write with a specific genre or musical style in mind, he gave that up long ago. “I don’t mean to take anything away from today’s writers,” he says, “but there are not as many genres as there used to be. But increasingly in the late 1960s, artists would approach him, asking for a song to fit a particular need. “I’d have Glen Campbell saying, ‘I need a follow-up for ‘By the Time I Get to Phoenix.’ And can you make it geographical?” Webb obliged, writing “Wichita Lineman.” When Webb recounts that exchange, he affects a spot-on imitation of Campbell’s down-home American accent; it’s clear how much he enjoys telling that story and countless others like it.